This is a fun Halloween activity correlated with second grade Language Arts Common Core standard RF.2.3a (differentiating between short and long vowel sounds). There are twelve pumpkins with Halloween themed words in them (such as bat and treat), each with a distinct long or short vowel sound. The students color the pumpkins with short vowel sounds orange, and long vowel sounds yellow. The page is also surrounded by a cute pumpkin-and-bats border. A fun way to incorporate Common Core at Halloween! * NOTE: The words are centered in the pumpkins, despite the off-center appearance of some in the thumbnail picture! See the preview to see part of the actual document. :) Thanks! 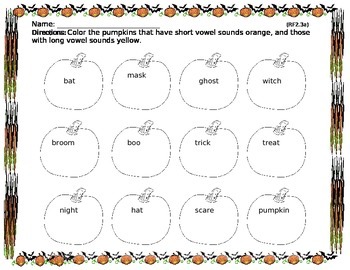 Pumpkin Vowel Sounds by Erin Linde is licensed under a Creative Commons Attribution-ShareAlike 3.0 Unported License.